Gingerbread Mondrian | As I blog. Every year, my family celebrates "Holiday Craft Day" on the day after Thanksgiving. We eat homemade turkey soup that my Nana makes from leftover turkey and my brothers, cousins, and I (and sometimes some extra friends) decorate gingerbread houses, ornaments, and stockings. It's one of my favorite traditions because I love my grandma's soup and I love to outcraft my siblings. Yes, crafting can be competitive. 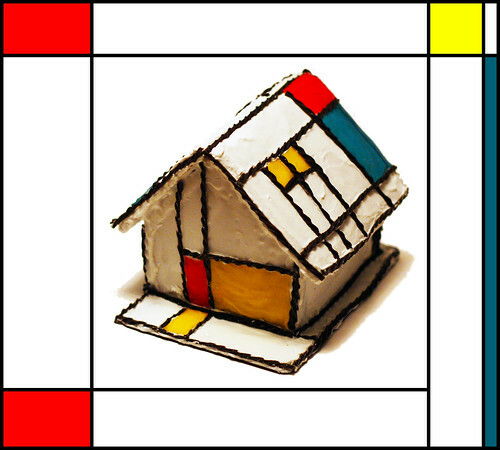 This year, I made a gingerbread house inspired by Mondrian. It's made of white frosting (which dripped everywhere), black licorice (gross! ), and colored fruit roll-ups. I hope Piet would be proud. I think you should find a gingerbread competition somewhere and submit this :-) Hell, if it made Mondrian famous, why not you?